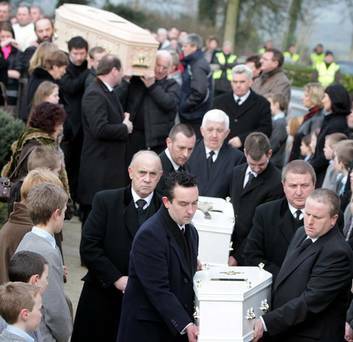 The funeral of Sharon Whelan (30), and her two daughters, Zara (7) and Nadia (2). When you stand at my parents front door and you look down the valley towards the town of Callan Co Kilkenny, you can see where my sister’s house used to stand, when you stand in my parents garden you can see the church where the funeral service took place and also the graveyard where Sharon and her two daughters, Zarah and Nadia are laid to rest. These are scenes and memories that are a constant part of everyday life for my parents and for every member of our family when we visit home. When we do visit home we are surrounded by walls of photographs of the girls, photographs of them as they grew, Sharon from a young girl to a woman and mother, and her girls from babies right up till the monstrous event that took their lives. Every time I look at these photographs I am overwhelmed with a sense of what might have been, a sense of anger at the hand that took them and a resignation that they are gone forever. Going home is very bittersweet for me; it’s great to spend time with my parents and for them to spend time with their grandchildren but also when I stand at that door and look down that valley, those horrific and traumatic ten days spent there, ten days of what started as, trying to come to terms with what we thought was a tragic accident, to being informed that the deaths were suspicious and finally to the realisation that it was going to be a full murder investigation. All these memories come flooding back like it was yesterday. Christmas day 2013, this will be the fifth anniversary of the death of Sharon and her two daughters. Five years have passed for us and we are still trying to come to terms with what happened. Five years have also passed for him, the murderer, Brian Hennessey, who is only now two years away from appearing in front of the parole board. Two years away from stating his case for freedom, a situation that we as a family find disgusting beyond words. The very notion that someone responsible for taking three innocent lives, in this state, can after seven years actually be even allowed to put a case forward for freedom, insults the memory of those whose lives were taken but also causes unnecessary stress and grief to the victims’ families. The issue of parole for homicide cases is only one of many issues regarding a justice system that in my view is broken and that continuously fails to serve victims and their families in a fair and equitable manner. In my own families case the issue of concurrent sentencing is one that continues to, and will forever be something that causes anger and confusion. At the sentencing after the trial Brian Hennessy was sentenced to three life terms, two to run consecutively and one to run concurrently. At the time we were relatively pleased with this and it was very noticeable in the court room the rarity of such a sentence as there was an audible intake of breath when the sentence was handed down. It was also noticeable what it meant to all who were involved in bringing the case to court, many of the investigating officers and gardaí were visibly moved and emotional on hearing the sentence and to a man and woman came to us in the courtroom to offer their sympathies. That is something we will never forget. When we witnessed this reaction it was really driven home to us as a family to how much it meant to these men and women of the police force, to see their painstakingly hard work culminate in such a strong sentence, but it does cross my mind from time to time now how they might be feeling now about how their work has been, in my view diminished by the result of the appeal that came the following year. Hennessey was ”successful” in his appeal with all sentences to now run concurrently, three murders, one life sentence and to this day no one can tell us which life he is serving his sentence for. This is something that our family find very hard to come to terms with and I would imagine causes great frustration with gardaí of every rank. The idea that all the hard work, man hours, forensics, hundreds of interviews, DNA samples, the work of the FLO’s who are so important to families, all the officers involved in bringing a successful prosecution, can only watch on as the justice system, as it is, lets them down as much as it lets families down by allowing murderers come before a parole board after only seven years appealing for their freedom. Along with the very frustrating and unsatisfactory sentencing policy of the state, another and equally important issue that causes serious concern to families, and I would imagine gardaí as well, is the issue of the bail laws. CSO figures released this year show that people out on bail were responsible for 40 murders in this state in the past five years. That’s 40 people that may not have died if the bail laws had been more stringent. How often have we heard of someone during a court case that has a litany of previous convictions, some of which may be violent, still get out on bail even though the gardaí at the time may have object to it. How often have we heard that person going on to commit the most horrific crimes? What is it going to take for the powers that be to see that these numbers are totally unacceptable and the current bail laws do not serve the citizens or the people charged with protecting the citizens in any way? How frustrating must it be for gardaí to see people who they know are a danger to the community being allowed to walk back out on to the streets time and time again? The effect on morale, I would imagine, is quite significant. My organisation are actively campaigning for changes to the sentencing and bail laws, among other reforms, we strongly feel that families are not being listened to when it comes to the justice system. We are calling on the Minister for Justice and the Government to look at the British model where anyone convicted of murder must serve a minimum tariff before being even considered for parole. These would vary from whole life tariffs down to 30, 25, 20, and 15 years, we feel the bail laws also need urgent reform. These are just two areas of the justice system that we feel can be and should be changed; all it takes is the political will to do so. These are starting points to reform a justice system that for many families that have been unfortunate enough to have gone through it, see as broke. I also feel, after being through the system, that these changes not just should happen, but must happen so both citizens and those charged with protecting them can have confidence in a system that honours victims and their families and also honours and values the work done by those protecting them.